The Taiga Explorer litter. Mother Noatak’s hurrican deshka du tumi (Sami) SE30530/2013 Eyes clear, HD: AA – ED:0 PN free and father (Back to work) Hjoki SE43700/2014 Eyes clear, PN: free. HD:A – ED:0 – Both dogs work at Laplands wolftrails tourist tours. Joki also prooved himself as leaddog at east point open 300 km race in 2014 and 2015. Both have high will to go, good temperaments and excellent polar traits. Sami is 28 kg and 60 cm. Joki is 63 cm 35-38 kg. He’s a very good trotter with long stride, but also a powerfull galop. 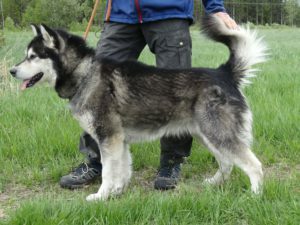 It’s a nice combination between 2 selfsure and non agressive alaskan malamutes. Previous offsprings (born februari 2016)are well sized malamutes with high energy level, social and non agressive malamutes. 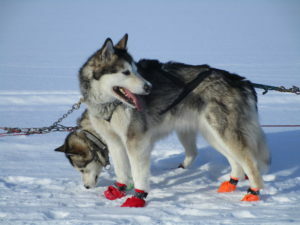 First sledpulling training showed eagerness to pull and good concentration. All 7 puppys find homes. 2 stay with us. 1 went to a malamute kennel in Finland, 1 to a malamute kennel in Sweden, 1 to a tourist kennel in Switserland and 2 to a working home in Germany.